I have to be honest, I have been excited about this burger since I heard about it a year ago. I have been waiting patiently, or not so patiently, for it to be available in my area. The marketing has wooed me and I have been dreaming of a vegan burger that can draw in omnivores. When I saw this was available at my local whole foods, I became diligent in trying to get my hands on a box or two. It was hard since they were selling like vegan hotcakes. 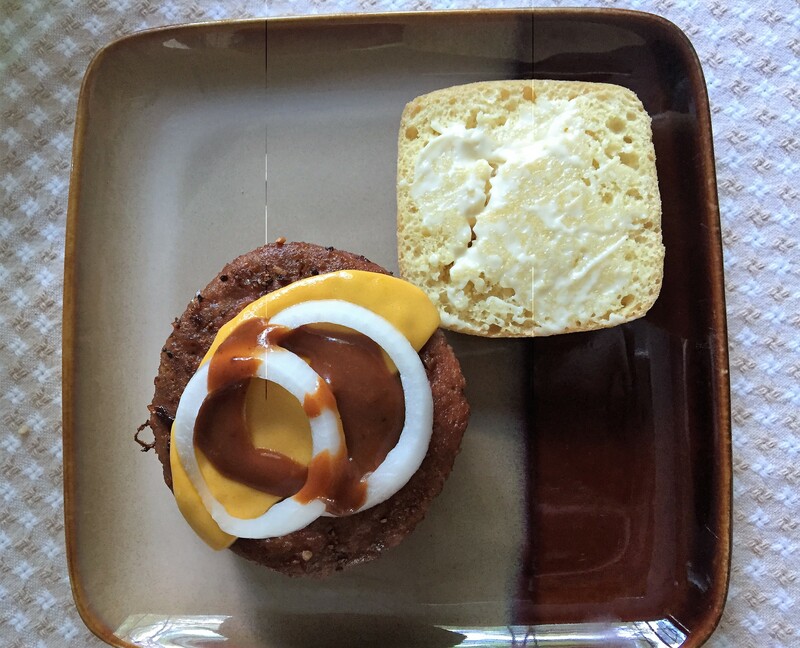 When I got my hands on a package, I decided to make a cheeseburger on a gluten free bun, with onions, vegan mayo, and BBQ sauce. If I would have had pickles in the house, they would have been on top as well. 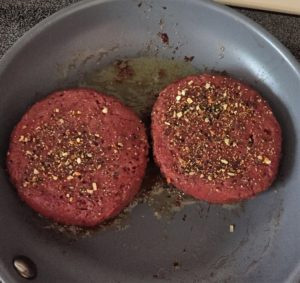 I had read reviews that my house would smell of meat when I cooked the burger and that I should be prepared to be disgusted by the look of the burger. Neither of those things happened. My home smelled delicious, but not of meat- it was more like a grilled veggie smell. The pinkness of the burger did not upset me because it still didn’t look like meat to me. I was a bit taken back by all of the oil in the burger and the calorie count. I knew this would only be an occasional treat for me. Fast forward to dinner and my first bite and I loved it! 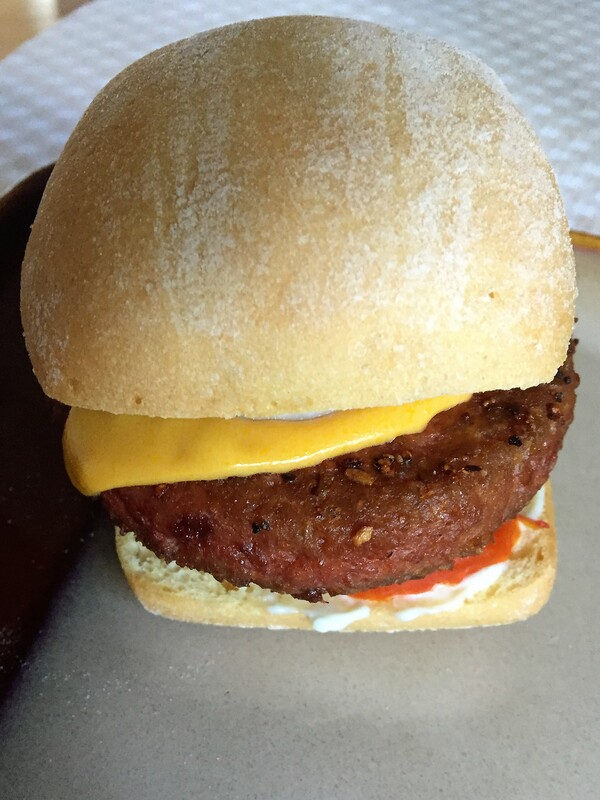 The texture was a bit “meaty”, but not anymore than other veggie burgers that are intended to imitate meat. It has been decades since I’ve had meat and this reminded me of a good veggie burger. It had an aftertaste of what I remember Boca burgers tasting like, only better. I am very excited for the omnivores in my life to give this a try at their next BBQ. This seems like a great burger for vegans, vegetarians, and omnivores. This burger becoming more available in stores across the country. Right now it is in Whole Foods and Safeways. It is packaged like meat to entice omnivores. It is vegan, gluten free, soy free, and delicious! It has 20g of protein! This needs its own bullet point, it is DELICIOUS! It does well on a pan and on the grill. It looks like a burger to entice omnivores. It is pricey! 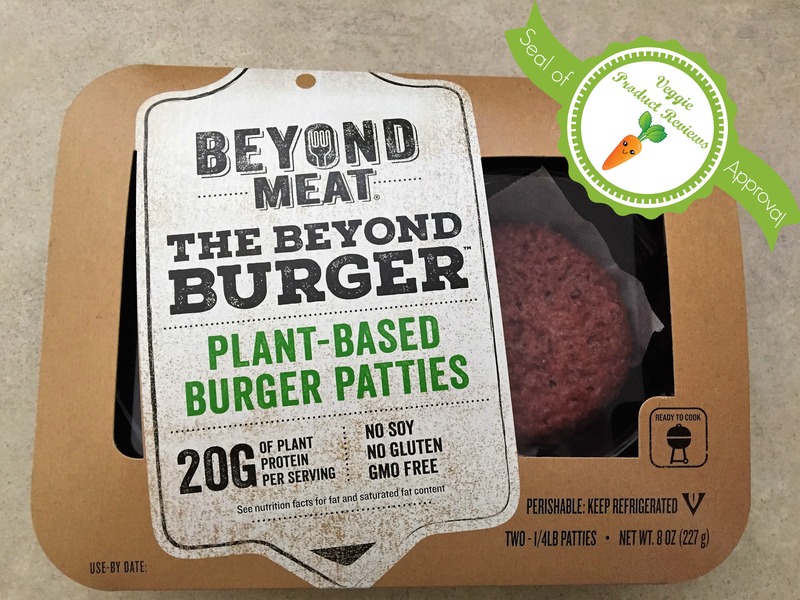 Whole foods sells it for almost $6 and there are two patties equaling a quarter of a pound. If we want to entice omnivores, this product needs to be cheaper or comparable to two meat burgers. It is too fattening for me. The amount of grease that came out, was a bit much for me. I don’t mind this food on occasion, but I can’t do this on a regular basis. The calorie count was also a bit high for my tastes. 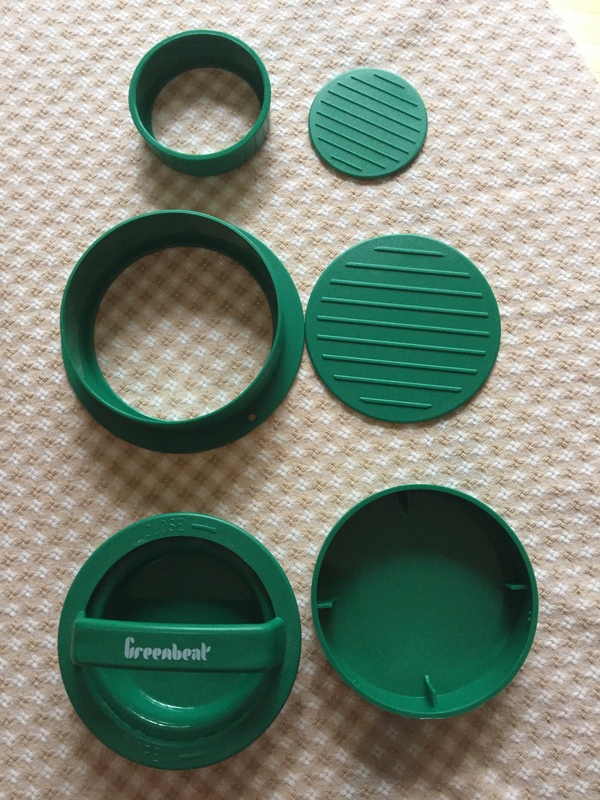 The plastic packaging is a bit much and seems wasteful. The container could be smaller. Most veggie burgers are offered in packages of 4 or 6. Two patties is just odd. We have a family of three, so we have to buy two packages for almost $12!! I finally got around to making zucchini noodles last week and I wanted just the right thing to go with them. 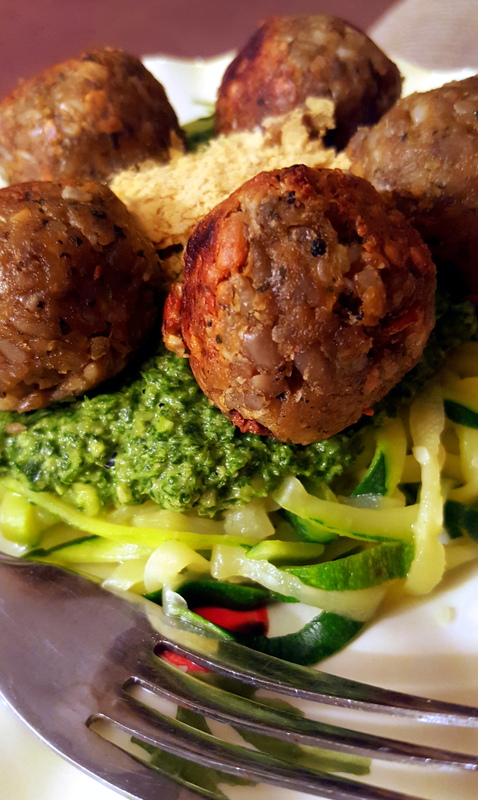 I’ve been eagerly awaiting the Beyond Meat “meatballs”, but I haven’t seen them in stores yet. I did come across these while I was checking for them. Overall Grade: B+ I really enjoyed them. If I were the only consideration, I probably would give them an A. I knocked it down just a little bit in consideration of our readers who aren’t gluten/soy free like I am. I can pronounce all the ingredients and regularly have them in my kitchen. They don’t really require quite as much oil as the directions say. But do be sure to continue to turn them and not just let them sit on one side for too long. They’re more likely to stick. The name is a bit misleading. 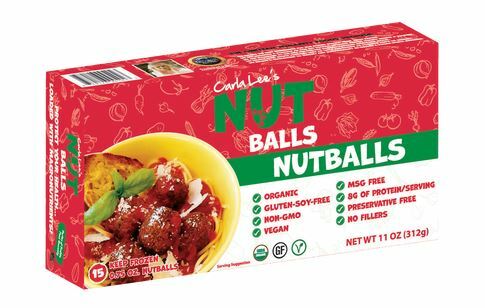 They’re called nut balls, but the first listed ingredient is brown rice. Even though they get a nice crisp on the outside, they’re a little soft. I foresee this being more of a problem for those of you who eat gluten / soy products. There is a whole world of veggie burgers out there. Even being gluten free, I have so many burger options. I actually get to choose what I like! 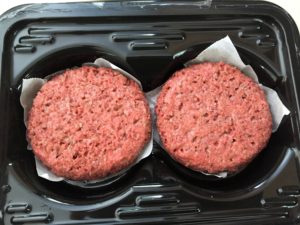 I’m not a big fan of burgers that taste like a meat substitute, I like ones that have veggies and/or grains and they are visible. I think it is because I want to know I’m eating a veggie burger. I don’t want that thought “OH NO! Is this a real burger?” thought when I’m eating it. 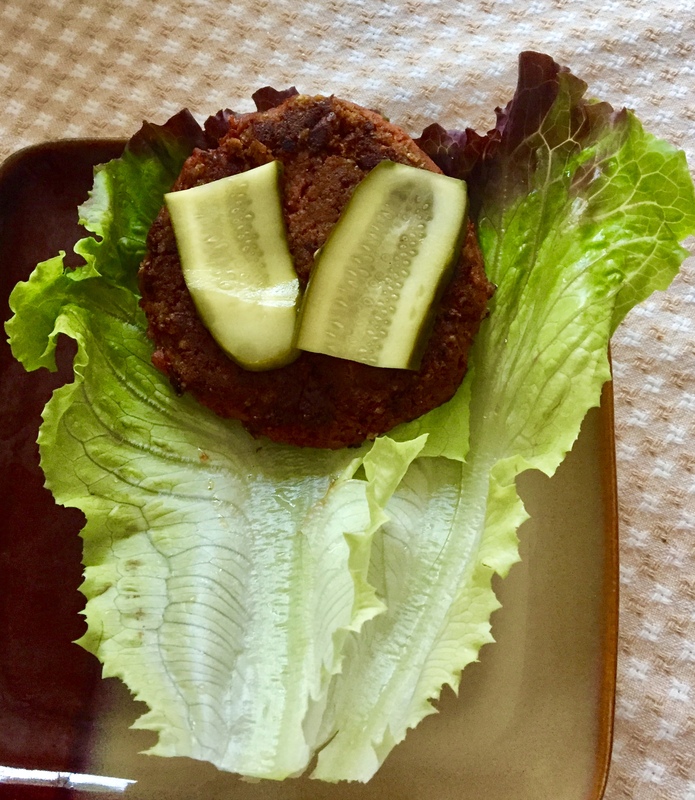 If you are someone who wants a veggie burger that tastes just like a burger made of beef, then this might not be your burger. 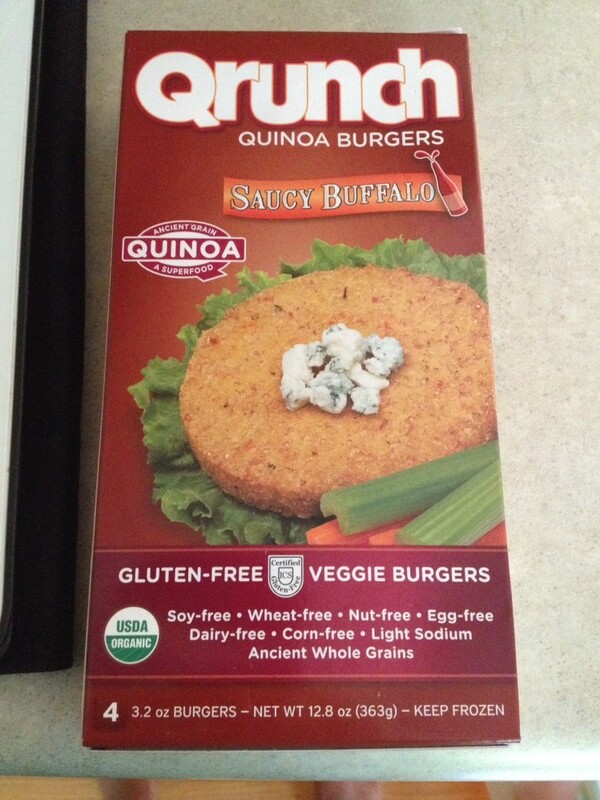 The Qrunch burgers are made mostly of quinoa, millet and amaranth and pack a crunch if cooked on a pan or in the oven. If made in the microwave, they don’t get a chance to get crispy. I am a fan of all of the Qrunch burgers that I’ve tried. Especially this Saucy Buffalo one. It wasn’t spicy enough for me and I didn’t get a lot of the Buffalo flavor come through, but I still really liked the taste. 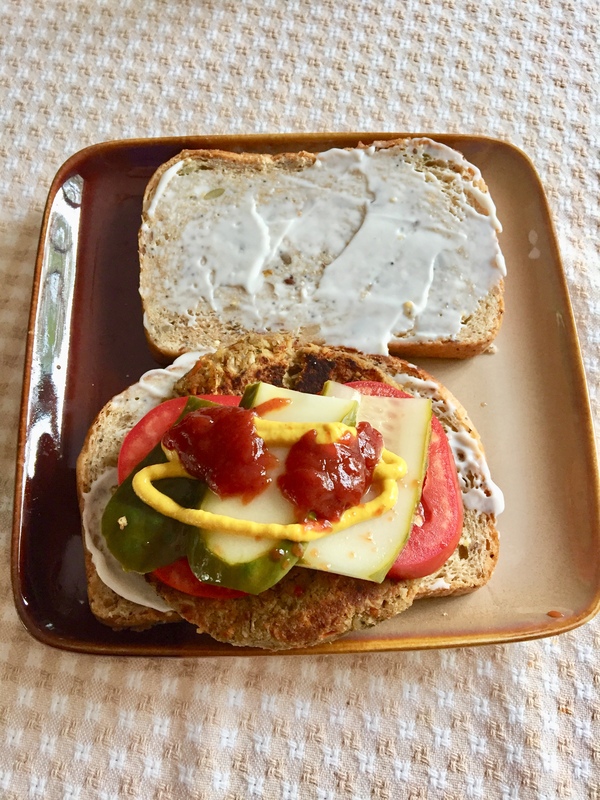 I enjoyed this burger with traditional toppings of vegan mayo, ketchup, mustard, pickles, tomato and lettuce. If you want to amp up the heat, I recommend a spicy BBQ sauce or a few dashes of your favorite hot sauce.